Charles Anton had explored the possibilities of a "Thredbo-type" development at Mt. Hotham in the mid-1960's, as recorded in the AAC Bulletin No.41 to the AAC members and in a letter dated 4 February 1965 to AAC office bearers and key Victorian Skiers such as Ken Myer, Bill Bridgford, Bruce Bretherton, Eric Burt, Warrand Begg, Ian Darby (the then skier-chairman of the Mt. Hotham Committee of Management) and George Chisholm. Charles had lunched the previous week with six of the key Victorians to discuss the low-level Hotham access option and it was agreed to reconnoiter the possible options in April 1965. Action on building an AAC lodge at Hotham was delayed because Charles wanted it to be built in the proposed low level village with its proposed year-round easy access, should that low level village eventuate. Whereas Thredbo's low-level access was provided by an already existing access road built for the Snowy Mountains Hydro Scheme, the Victorian Authorities had no need for a similar low-level access to the Hotham area, such as a road along the West Kiewa and the Diamantina Rivers. In Bulletin No.42 dated 27 October 1965, Charles had reported that "Developments at Hotham have been slow" because the Victorian Government had not yet introduced legislation to allow binding franchises to be issued for uphill transport etc., in its ski resorts. Additionally, the Government had yet to commit to the investigation of a low-level access road to Mt. Hotham. 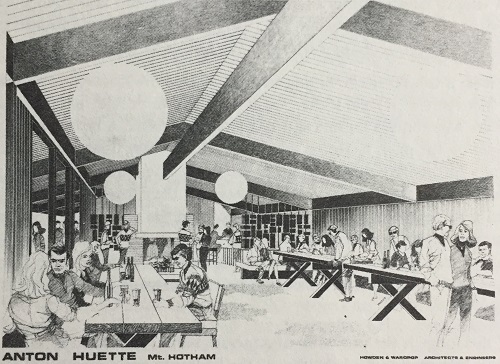 The "Thredbo-type" development of Hotham was put on hold, as was the AAC's Hotham Huette. Hotham Heights and so Peter de Crespigny and Warren Peck went to Hotham to inspect potential lodge sites on a weekend during the ski season. They aimed to find a site that was reasonably protected from the full force of Hotham's Winter storms. Hence the weekend they chose for their inspection visit, was forecast to have strong winds with snow flurries. 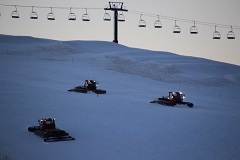 They first inspected some flat areas close to the Alpine Road near the Sun Run T-Bar ski lift and Loch Spur. Both men were blown over several times in the blustery conditions ! Clearly these were unsuitable sites for a ski lodge. They then walked back along the Alpine Road through the Hotham Heights Village to the Davenport Subdivision. The most sheltered undeveloped land they could find was located between two, rarely used ski runs, on which site Anton Huette (Photo No. 37) was subsequently built. The only service then available to lodges was running water. Each Hotham lodge had to provide its own means of lighting and heating the lodge as well as a means of cooking food. The lodge was opened in 1973 and subsequently had its "teething problems". In order to save money, the electricity generator was installed in the basement of the lodge, rather than in a separate building. After several problems, culminating in a fire that was fortunately confined to the generator room, the lodge was closed a couple of weeks before the end of its first ski season and a new stand-alone generator building was constructed over the 1973/74 Summer. The Anton Members are very interested in the AAC Ski Races and in Ski Touring. 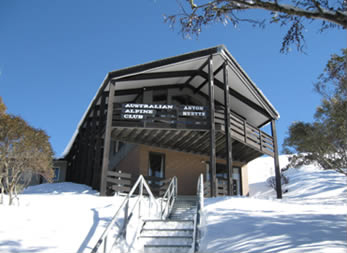 Under the leadership of Dr Noel Carter in 1977, the Anton members, with the assistance of John Brownlie of Algona Guides, expanded the scope of the original AAC Ski Tourers Handbook (that had been prepared in the 1960's by Perisher Huette), so as to include Victorian and Tasmanian ski fields. Every AAC member received a copy in 1978 and copies of this 112 page book, "Ski Touring in Australia", were sold through outdoor and ski shops under the Algona Guides banner (Photo No. 38). At 120mm by 180mm, it fitted neatly into an outer pocket of a rucksack. In 1986, John Siseman, Warren Peck and John Brownlie revised and expanded it to 136 pages in a bigger format (135mm by 215mm). All copies of this Second Edition were sold by 1992.